Henry Jenner | Cornwall For Ever! Henry Jenner helped to create more interest in Cornish language and culture in the early 1900s. He strengthened Cornwall’s Celtic identity and set up the Cornish Gorsedh and the Federation of Old Cornwall Societies. Henry Jenner a weresa sordya moy bern y’n yeth ha gonisogeth kernewek yn 1900ow a-varr. Ev a grefha honanieth keltek Kernow ha fondya Gorsedh Kernow ha’n Keffrysyans a Gowethasow Kernow Goth. Henry Jenner was born in St Columb Major in 1848. As a boy, he was excited to learn that there was a Cornish language. He would remain interested in the language for the whole of his life. In 1870, Henry took a job working in the British Museum in London. While he was there, he discovered an early Cornish language poem written around 1400AD. It became known as ‘The Charter Fragment’. In 1904, Henry wrote a book called A Handbook of the Cornish Language. 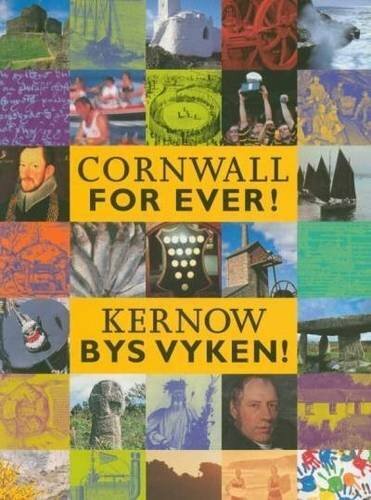 This was the first book ever written to help people learn the Cornish language. Also in 1904, Henry campaigned for Cornwall to join the Celtic Congress, an international group that promoted the Celtic languages. Henry said that Cornwall should be allowed to join because it had its own Celtic language and culture. The Celtic Congress agreed and confirmed Cornwall’s membership by sending a telegram to Henry in Cornish. In 1909, Henry and his wife Kitty returned to Cornwall. Working with his friend Robert Morton Nance, Henry became President of the first Old Cornwall Society in St Ives, in 1920. Old Cornwall Societies celebrate the traditions and customs that make Cornwall unique and important. Henry and Robert also formed the Cornish Gorsedh, which exists to maintain and display the spirit of Cornwall as a Celtic country. Henry and Robert held the first Gorsedh ceremony at Boscawen-Un, near St Buryan, on 21st September 1928. Henry was the first Grand Bard (leader) of the Cornish Gorsedh. Henry continued to take an active role in promoting Cornish language and culture in his later life. He attended midsummer fire ceremonies and the first church service to be held in the Cornish language for 250 years at Towednack. He died in 1934, aged 85.